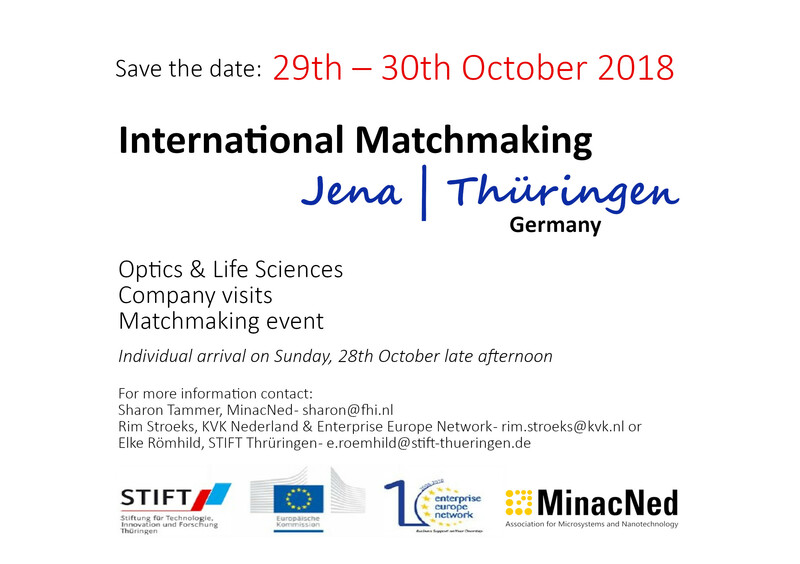 Home » News » Registration for International Matchmaking Event Thueringen is open! 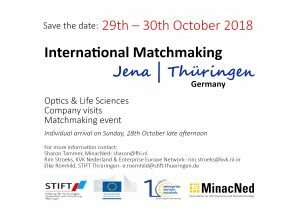 Registration for International Matchmaking Event Thueringen is open! The program for the International Matchmaking Event with company visits Jena is final! In collaboration with the Enterprise Europe Network (KvK, Thüringen and the Netherlands), Medways Germany and Fluigent we are offering a matchmaking event with onsite company visits in the Optic and Life Science sector. About 10 – 15 Dutch attendees will have the opportunity to visit selected innovative companies and R&D institutions in Jena. The trip includes company visits, matchmaking event with companies you can select from the catalogue, optional individual meetings with companies, entrance to the planetarium, a social dinner and lunch. Costs for this trip are for MinacNed members € 850,- excl. VAT, for non-members € 1050,- excl. VAT. (Costs are exclusive hotel and transport to and from Jena). Are you interested in this Matchmaking event? Don’t wait too long to send in your registration form, there are just a few places to join us. For questions or more information, please contact Sharon Tammer. We hope to see you in Jena!